Our lotus-shaped incense holder symbolizes beauty, purity and spiritual knowledge. It comes with a crystal and rhinestone incense tray. Suitable for any room of the home, it makes an elegant engagement, wedding or housewarming gift. 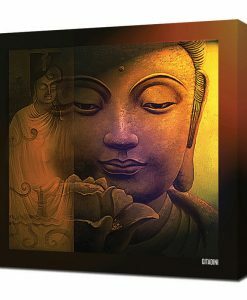 Our crystal home accessories blend spiritual symbolism with elegant materials and designs inspired by the sacred lotus. The lotus plant emerges from lake beds to bloom above the water’s surface. Its flower is thus an auspicious symbol and a reminder to rise above mundane life, live purely and improve oneself through knowledge. The beauty and transparency of crystal also remind us to reflect upon life and seek spiritual connections. Some of our crystal accessories feature light-reflecting metallic finishes in copper, silver and gold colors. Copper represents the pink lotus, silver the white lotus, while gold – the purest metal – represents a state of highest enlightenment. This crystal incense holder and tray provide beautiful and practical decor for any room of the home. The incense holder is shaped like a delicate lotus flower, a traditional symbol of beauty, purity and spiritual knowledge. It sits on an elegant crystal and rhinestone tray that catches the ashes.